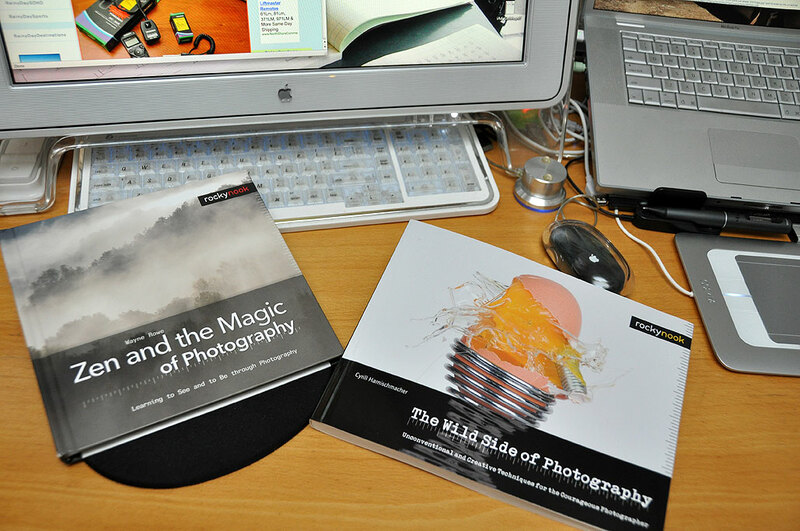 We are huge fans of photography books from Rocky Nook. The two we recently added to our ever-growing library of Rocky Nook photography books are The Wild side of Photography and Zen and the Magic of Photography. These books are pretty much at different ends of the creative spectrum. The Wild side of Photography is a collection of different projects from seventeen different photographers, each with their own unique perspective on creativity. The book covers unusual themes such as experimental focusing, spherical panoramas, camera hacks, etc… If you want crazy, it is in there. The articles not only explain the techniques involved, but also gives ideas on where to go next should readers want to further experiment. Yesterday, we took a FirstLook at an interval timer from Yongnuo. Many of the projects in The Wild Side of Photography uses devices such as timers, synchronized flash, and remote triggers to achieve the special effects. We will definitely find inspiration in this book as we look for creative ways to exercise the Yongnuo timer for our FirstUse review! The second book, Zen and the Magic of Photography by Wayne Rowe, is different from the typical “how-to” photography books. We had recommended it for our Summer reading list and have just finished reading it for a second time. Zen is a state of mind, of awareness, and being. Rowe looks at the connection of seeing through the camera and being in the moment. He examines his past experiences and times when photographic opportunities met up with observations, recognition, and execution. This book is less about the right technique and more about no technique. It is about the point where Zen and Photography meets. Rocky Nook’s two latest offerings mesh perfectly with the projects we are hoping to attempt this Fall. We’ll report back on our progress in a few months. In the meantime, whether you are looking for some new photography challenges or want to pick up some new techniques, go check out their collection of great photography books, get inspired, and start shooting!